With only a month until Christmas, Miffy has rounded up the best gifts to give to children this year. From cuddly plush to snug pyjamas great for Christmas eve, there’s something that every little one will enjoy. A fun Christmas tradition involves buying children new pyjamas for them to wear on Christmas day (they’re usually allowed to open this gift on Christmas eve!). These cosy, long sleeve Miffy pyjamas from Next are just the thing. With an all over Miffy print and a pocked with Miffy’s teddy peeking out, these will keep your little one tucked up in bed while they wait for Father Christmas. The new Miffy art case will keep little ones busy over the Christmas holiday – they can make and create anything their imagination can think of using the pens, crayons and pencils. It’s never been fun to colour your world with Miffy! 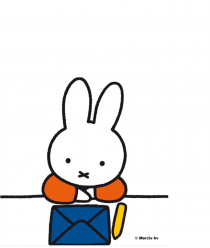 Send your little one into dream land by reading them a fun Miffy story book! Choose from over 20 books on the Miffy Shop – there are ones with activities, stickers and even a wipe-clean one so your little one can draw! Brrrrrrrrrrrrrr! These gorgeous Winter Miffys are available as a fluffy keyring or a plush which is 33cm tall. Both are dressed in a lovely black and white stripy scarf – keeping Miffy warm for any adventure that lies ahead. The plush is perfect for cuddling, playing or collecting – it’s also suitable for grown ups! Light up your child’s bedroom with the new Miffy night lamp! Featuring Miffy in her iconic red dress, this gorgeous lamp has a dimmable switch, so you can adjust the brightness as your little one drifts to sleep. A must have for any little Miffy fan.